Ralph Allwood MBE, a former Associate Music Director of the Brandenburg Choral Festival of London, brings two of his fabulous choirs to the 2018 Spring Series. The Choir of Queens’ College, Cambridge, and the Old Royal Naval College Trinity Laban Chapel Choir will combine to perform two major choral works, Handel’s Dixit Dominus and Mozart’s Requiem with orchestral accompaniment provided by Brandenburg Sinfonia. Join us in the beautiful surroundings of a candlelit St Martin-in-the-Fields to hear some of the country’s finest young voices under the expert direction of one of the most fantastic choral conductors around. Robert Porter founded the Brandenburg Sinfonia in the early 1980s, the first of a group of orchestras under his artistic direction, which now also includes the Brandenburg Brass and Brandenburg Baroque Soloists. 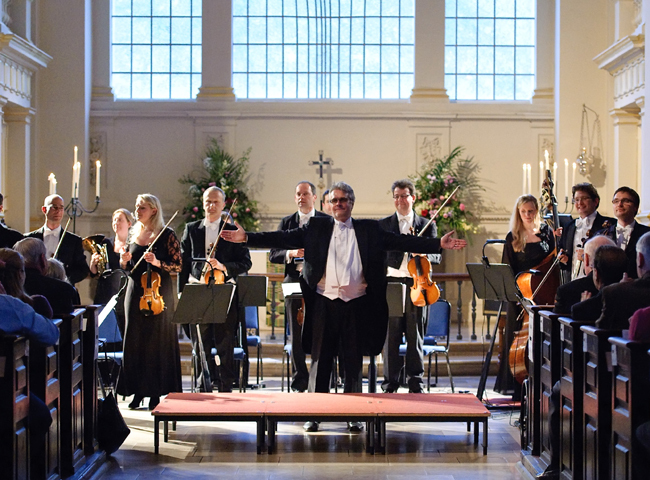 Playing regularly both in this country and abroad, one residency, at St Martin-in-the-Fields gave him the idea for a Choral Festival based around some of the most beautiful churches in London. Starting in 2010 with six concerts at St Martins, the Brandenburg Choral Festival is now the largest and most significant Choral Festival in the country. This year the Festival boasted more than 70 choirs in 67 concerts, covering the standard masterpieces of the choral repertoire along with jazz, barbershop and gospel, also making it one of the most varied and inclusive Choral Festivals! Or a selection of the following?